I'm currently black and blue. I have more bruises than I care to count, my backpack rubs uncomfortably and my foot hurts when I walk. And I wouldn't change it for the World. Today I thought I'd dedicate an entire blog post to my newest love - pole fitness. I already mentioned in my 100 happy days post (here) that I started pole fitness a few months ago. Since then my love for it has grown and I find myself wishing that I could practice every single day. Unfortunately lack of space in my house means this isn't possible, but that only makes me more impatient for the next class! The first lesson arrived and it was as enjoyable as we had hoped. The teacher took us through a variety of Bronze moves (the lowest level of difficulty) and we even managed to kick upside down. With each class our ability and enthusiasm grew. 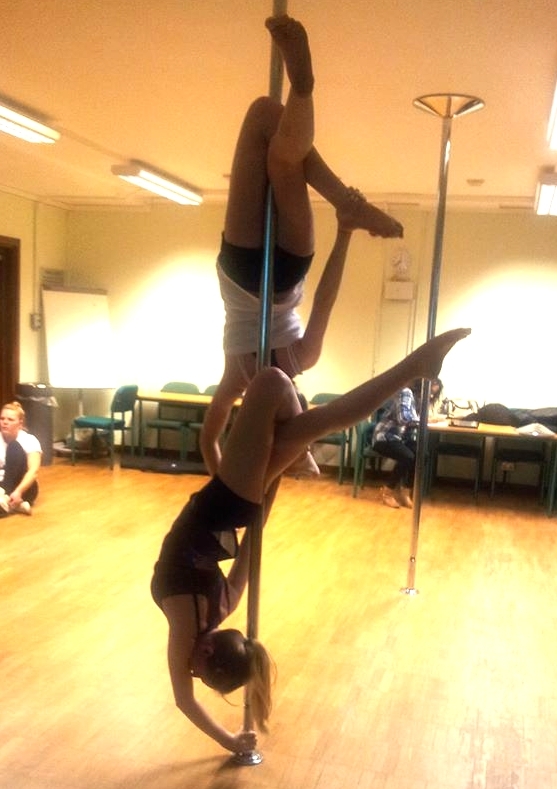 Nowadays we spend most of the lessons completing Silver level moves, and the teacher has just started showing Jess and I how to complete doubles moves (one category in Pole competitions is Doubles, where two people share one pole to perform). I can't believe we've managed to improve so much in such a short space of time. Starting pole has also given me the incentive to improve my body. I've started stretching every day and incorporating some exercises to improve my strength. Professional pole dancers have such incredible bodies, and even though I know I probably won't get to their level, I'm damn well determined to try. If it hasn't already been made obvious throughout this post, I highly recommend pole fitness to anyone wanting to try something new. Classes which cater to every level of ability are available, and if you're passionate enough you will consistently see improvement (although there's certainly no pressure to move onto more difficult moves if you're not ready!). I haven't enjoyed anything so much since I quit figure skating. Just a note though, it hurts. Sometimes a little, sometimes a lot. When you start taking your hands off the pole the moves rely on the friction between your skin and the pole keeping you in position. But what do they say? No pain no gain. Sometimes I subject my body to two lessons a week, so it can't be that bad. And if I can deal with it, I assure you most everyone can. So if this post excites you and you're willing to try something new, what are you waiting for? Go for it and potentially find a new passion just like I did. Do you have a hobby that you love and highly recommend? I've always wanted to try this! You look so graceful and gorgeous!